In my recent blog post, I commented on the lack of influence the public has in shaping federal agencies’ missions due to the limited number of opportunities allowing them to meaningfully articulate their values, particularly in the case of NASA’s human spaceflight program. If a committee charged with the specific appointment of understanding public value finds it difficult to complete the task of connecting experts, stakeholders, and the lay public, the feasibility of any mission agency accomplishing the same amongst its own daily responsibilities, unforeseen crisis, and budgetary uncertainties is low and may even border on a fantasy. That is because the process of connecting experts generating scientific knowledge with decision-makers is not a trivial pursuit. Leon Fuerth, former national security adviser to Vice President Al Gore, commented in a Wilson Center forum on a 21st Century Model for Anticipatory Governance that in our current system of government, knowledge is seen as power and that all direction and knowledge comes from the top, creating a very rigid structure and environment. If current knowledge exclusively comes from the top, aka “experts,” then engaging broader audiences seems daunting when there are structural impediments standing in the way of connecting the scientist with the end user. I had a chance to discuss this particular issue with Adam Parris, a physical scientist and Regional Integrated Sciences and Assessments (RISA) Program manager at the National Oceanic and Atmospheric Administration (NOAA). I was speaking with him as a follow up to an inter-agency panel presentation on “How Science and Management in the Mission Agencies Create Disruptions and Spur Innovation.” In addition to the structural impediments, he pointed out that limited incentives are provided for science experts and decision-makers to interact. Conversations between both parties have their own set of challenges, including what Parris underscores as two key differences, their different vocabularies and their different reasons for wanting to engage with each other. Science managers in various agencies can foster relationships between science experts and decision-makers and make co-production of knowledge a possibility. Co-production leads to research that can effectively address a problem that the scientist and practitioner jointly identify, adding to each other’s accountability for finding the solution and implementing it. This joint venture can produce “usable science,” a science based on research that focuses on societal needs that joins the research process with the decision making process. However, as appealing the idea of co-production and usable science may sound in theory, it is difficult to implement in practice. In addition to the structural challenge of connecting science expert with decision-maker, it is also difficult to connect science experts with one another, especially when they work at different agencies. Much like in academia where researchers are divided by disciplines working in contained research silos, the ‘brick and mortar’ government agencies are constrained by their own missions. 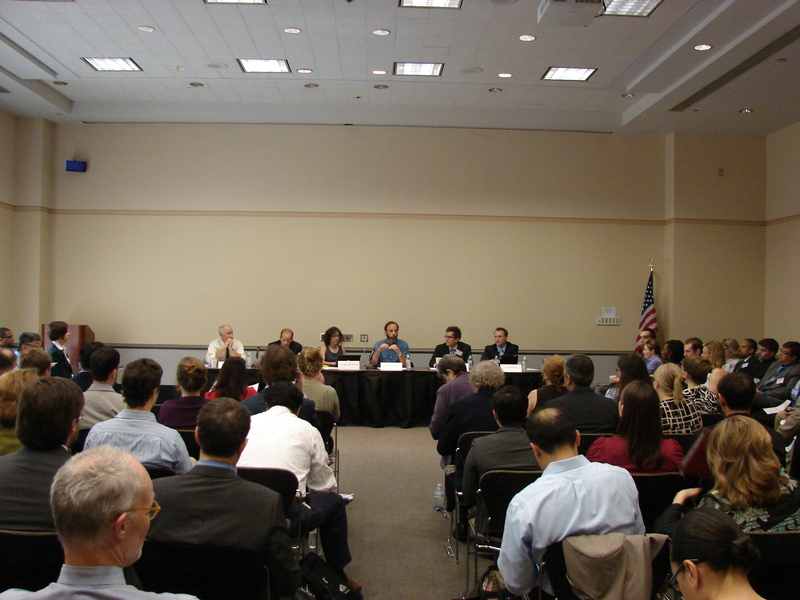 At the June 5 discussions, panelists proposed that science managers should respond to the need for inter-agency interactions by creating incentives for people of different agencies to foster sustained relationships with one another. By embracing and facilitating these types of unorthodox relationships, agents can interact outside of their agencies, and allow integration around emerging problems rather than agency missions. This is particularly important because contemporary problems such as drought, sea level rise or oil spills continue to become more and more complex where elements from one mission domain affect elements of other domains. This growing complexity increases the need for science managers to work as boundary spanners, helping to bridge the gaps in knowledge and action by forging relationships with science experts, decision-makers and end users. While a vision formed from the knowledge of both science expert and decision-maker is helpful in drafting effective policy, the view is not complete without public or end user input. As I wrote in my previous blog, engaging the unusual suspects will generate a diverse and creative dialogue that is invaluable when developing science and technology policy in the midst of shrinking budgets and painful cuts. However, accessing usable public values requires different types of boundary spanners. Informal science education institutions, like science museums and science centers, are an unconventional, but effective mean to gain insight from the non-scientific community. Informal science centers educate and engage with members of the public, permitting the thoughts and opinions of the visiting public to be extracted. These boundary spanners can create the safe space for an uninformed public to discuss and share their opinions and concerns. While there are examples of the government trying to engage the public on matters of policy and practice through platforms such as the open government initiative, challenge.gov and We the People, the mere designation of space for dialogue does not necessarily ensure generation of usable knowledge. The importance of the boundary spanner is that they can engage the audience and pool the opinions of those who may not ordinarily be drawn into conversations about science and policy, effectively creating dynamic and engaging spaces. The trick in the case of both usable science and usable public values is to co-generate the expert, stakeholder and public opinion. Boundary spanners’ can cultivate experts who know how to facilitate these types of conversations, who support the development of relationships over the short and long term, and who can step in to organize these spaces. The existing system garners the need for boundary organizations in the form of formal institutions like think tanks as well as informal spaces, like science centers and museums. Both of these types of organizations are needed for effective coordination of agencies and better understanding and integration of public values. Previous Between Beijing and the Expert: Is Public Opinion Changing China?